by Patrick F. Fagan, Ph.D. & Althea Nagai, Ph.D. 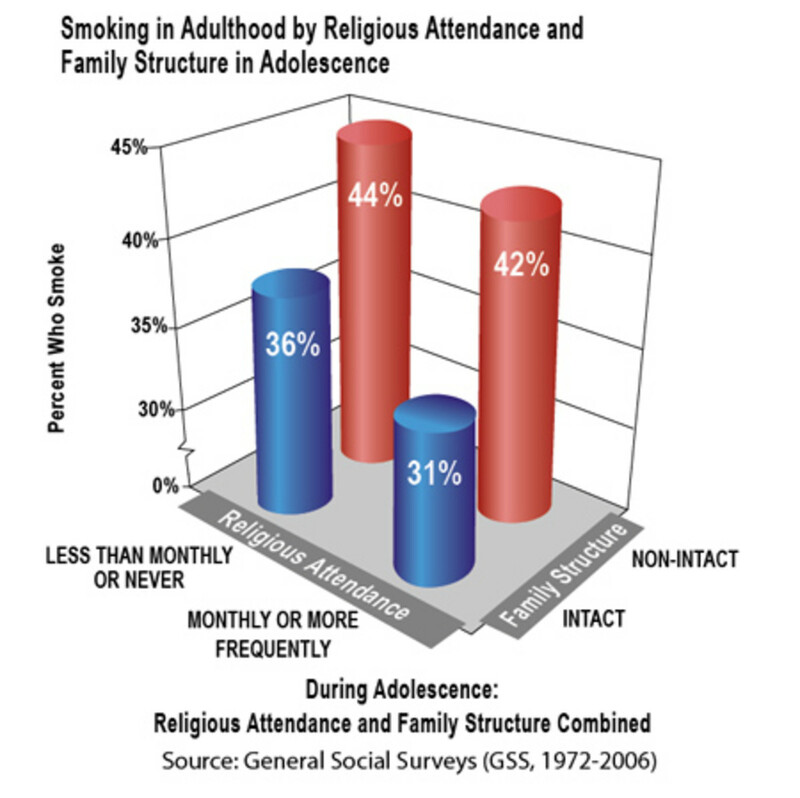 Adults who frequently attended religious services as adolescents and grew up living with both biological parents are least likely to smoke. 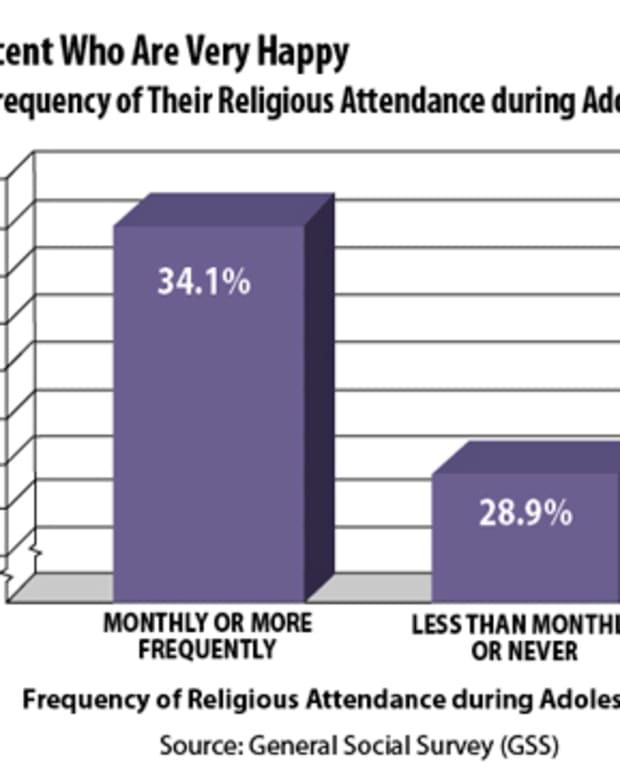 According to the General Social Surveys (GSS), 31 percent of adults who attended religious services at least monthly and lived in an intact family through adolescence currently smoke, compared to 44 percent of those who attended religious services less than monthly and grew up in a non-intact family. 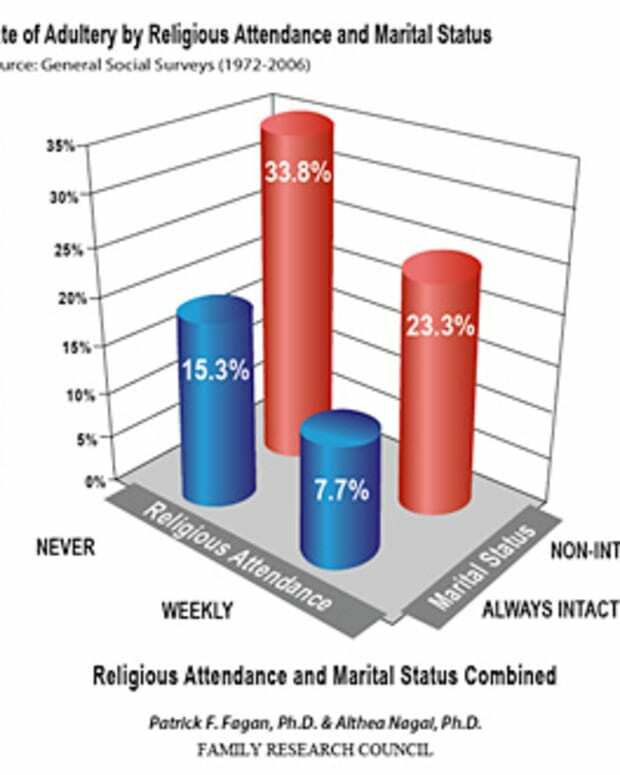 In between were those who attended religious services at least monthly but lived in a non-intact family (42 percent) and those who grew up in an intact family but worshiped less than monthly (36 percent). Several other studies corroborate the direction of these findings. In a study of Australian twins, Arpana Agrawal of the Washington University School of Medicine in St. Louis and colleagues found that infrequent religious attendance correlated with frequent cigarette smoking and that "children separated from a biological parent were...more likely to report regular cigarette smoking as adults." Analyzing various degrees of smoking in adolescents, Stephen Soldz and Xingjia Cui of Health and Addictions Research reported that nonsmokers attended religious services most frequently, whereas early escalator smokers attended less frequently and continuous smokers least frequently. They also found that at the sixth grade in school, "quitters and experimenters were more likely to be living with both parents, whereas late escalators and continuous smokers were more likely to be living with a single parent or an extended family." 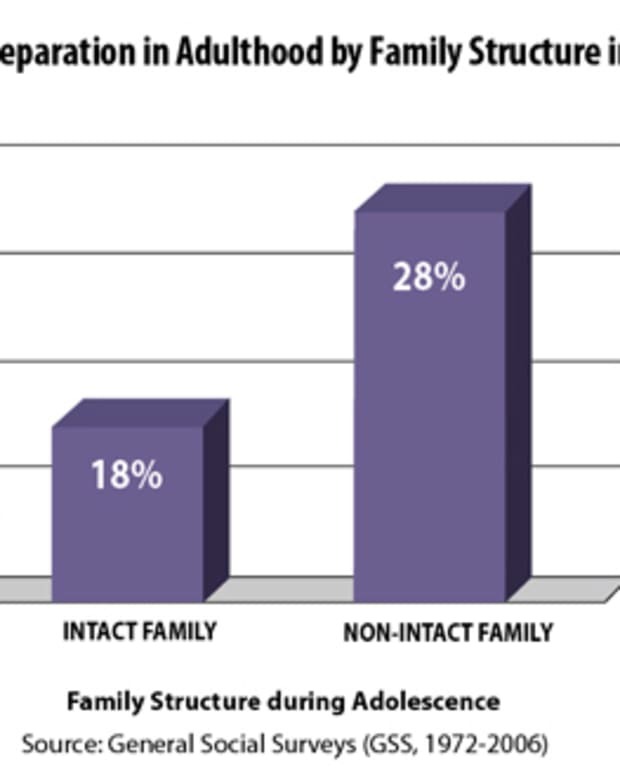 Thomas Wills of Yeshiva University and colleagues also found that adolescents&apos; religiosity was inversely correlated with tobacco use and that adolescents from intact families were less likely to use tobacco than those from blended and single-parent families. 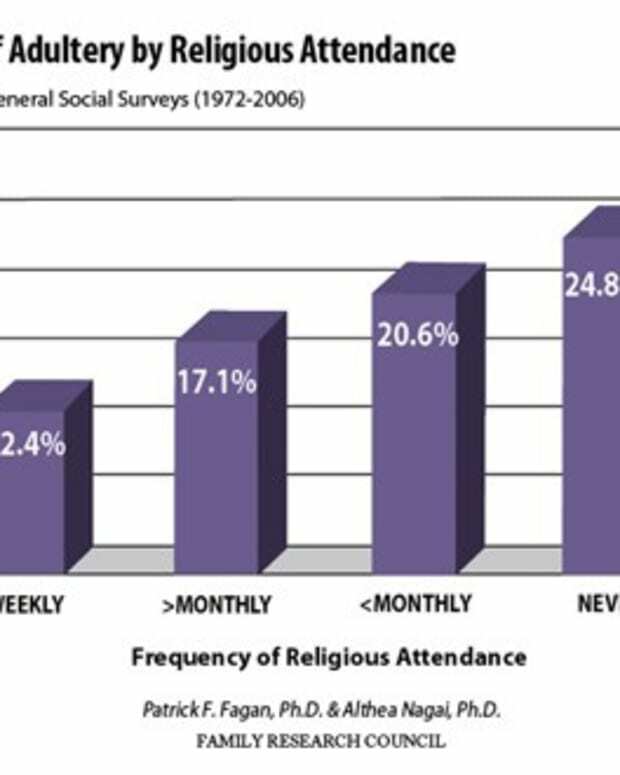 As the evidence demonstrates, frequent religious attendance and intact families are just what the surgeon general ordered. Dr. Fagan is senior fellow and director of the Center for Family and Religion at Family Research Council. Dr. Nagai is a visiting fellow at Family Research Council. This chart draws on data collected by the General Social Surveys, 1972-2006. From 1972 to 1993, the sample size averaged 1,500 each year. No GSS was conducted in 1979, 1981, or 1992. Since 1994, the GSS has been conducted only in even-numbered years and uses two samples per GSS that total approximately 3,000. In 2006, a third sample was added for a total sample size of 4,510. Arpana Agrawal, et al., "Correlates of Regular Cigarette Smoking in a Population-based Sample of Australian Twins," Addiction, vol. 100 (2005): 1,709-1,719. Stephen Soldz and Xingjia Cui, "Pathways through Adolescent Smoking: A 7-Year Longitudinal Grouping Analysis," Health Psychology, vol. 21 (2002): 495-504. Thomas Ashby Wills, et al., "Buffering Effect of Religiosity for Adolescent Substance Use," Psychology of Addictive Behaviors, vol. 17 (2003): 24-31.